When it comes to buying silver bullion the 100 oz bar has been a worldwide favorite for decades. The five bars pictured below are live links so our current buy price (blue) or sell price (green) is easy to see and more information is just a click away. As you consider the options you will find that all quality 100 oz silver bars are similar in the way they are made and identified. They are also similar in price and follow closely the silver “spot” market. Typical premiums may change somewhat depending on availability and demand but all shown are traded worldwide. Each of these 100 oz silver bars is produced by a world-class refiner – recognized for strict refining methods and integrity. The finishes on each bar may vary – some are matte some are polished and some contain additional security features. Bars depending on the refiner may be struck or poured – this distinction is really just personal choice. Each bar is marked as to weight, purity and content. It is this consistency which allows dealers to trade in these bars by posting live “buy” and “sell” prices based on the price of silver. The RCM 100 oz silver bar is manufactured by the Royal Canadian Mint. RCM 100 oz silver bar is poured, finely finished and contain the following identification marks etched into their surface: (1) An English and French circle at the top of the bar reading Royal Canadian Mint and Monnaie Royale Canadienne. 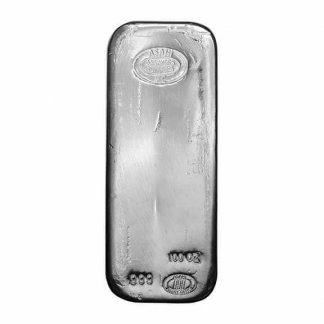 (2) The RCM 100 oz silver bar is stamped with the year of manufacture. (3) Each RCM 100 oz silver bar contains a unique 6 digit serial number. (4) The weight of the RCM bar is marked (100 tr. oz.) and beneath the weight mark is its purity stamp (AG 999.9). 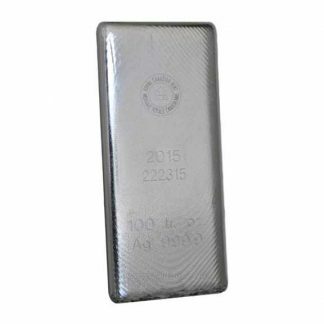 The JM 100 oz silver bar is manufactured by Johnson Matthey and has been an industry standard for decades. 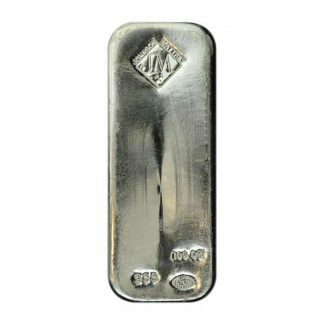 The secondary market JM 100 oz silver bar can be poured, struck or extruded and features the familiar JM trademark, weight, purity, fineness. Depending on when the bar was produced it may or may not contain a unique serial number. The Asahi 100 oz silver bar is poured and carries a matte finish. It includes rounded edges and contains the following hallmarks: (1) the famous Asahi trademark at the top of the bar and the name of the maker – Asahi Assayers / Refiners. (2) The weight of the Asahi 100 oz Silver Bar is marked (100 oz). (3) Beneath the weight mark is the purity stamp (999). 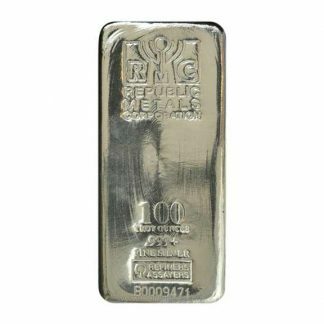 The RMC 100 oz silver bar is poured, finely finished including rounded edges and contains these hallmarks: (1) the famous Republic Metals Corporation trademark at the top of the bar. (2) The maker – Republic Metals Corporation. (3) The weight of the RCM bar is clearly marked (100 Troy Ounces) and beneath the weight mark is its purity stamp (.999+). (4) The words Fine Silver are included along with a manufacturing hallmark. (5) Each RMC 100 oz silver bar contains a unique 8 character serial number etched into the bar. 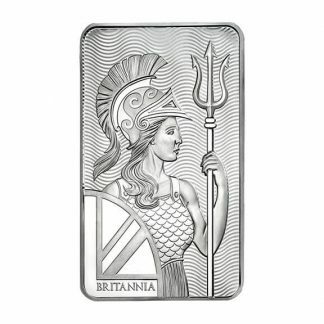 The 100 oz Silver Bar Britannia is easy to recognize and is a beautifully struck bar minted in such a way as to produce alternating frosted and reflective surfaces – a unique security feature. It comes in a custom soft plastic holder which is excellent for long term storage. The front of this bar uses a modern rendition of Britannia (the female personification of Britain) holding the traditional shield and trident. The reverse of this 100 oz Silver Bar Britannia contains these hallmarks in relief: (1) the purity (.999 FINE SILVER). (2) The weight of the bar (100 troy ounces). Visit our Audio Gold News Page for daily updates on the precious metals.